The deliberately slow rollout of Madden NFL 12 ratings continues with four more teams being broken down so far this week. Only two more AFC teams remain (Jaguars, Titans) and then it’ll be on to the NFC. Check out the rosters and ratings for the Pittsburgh Steelers, Cleveland Browns, Houston Texans, and Indianapolis Colts. Of these teams only the Texans look to have changed significantly from these original rosters by picking up Johnathan Joseph and Danieal Manning but losing Vonta Leach. The other three held pretty steady and didn’t make any big moves beyond re-signing some of their own free agents. Again keep in mind these are the base rosters and predate all transactions that began taking place last week. As always leave any thoughts on the ratings in the comments! 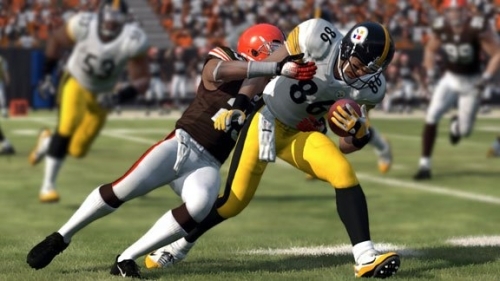 Peyton Hillis a 99 trucking 98 stiff arm 87 speed and a 91 acceleration………..REALLY. OK so your saying that peyton hillis can outrun michael”the burner”turner.false. peyton hillis runs a 4.57 in the 40.Michael Turner ran a 4.51 in the 40. These are 2010 results.also the trucking.Donny Moore your saying peyton hillis is the best powerback in the league?really?HELL NO!!!!!! !Every one with an IQ of 80 and above knows that Michael turner and Marshawn Lynch truck the best I mean michael turner dragged 255lb pat thomas for 5 yards in 2010 and marshawn lynch’s 67 yard touchdown and his 7 yard run against the giants.Peyton is overated i give him a 90 trucking 84 speed 91 acceleration and a 95 stiff arm.